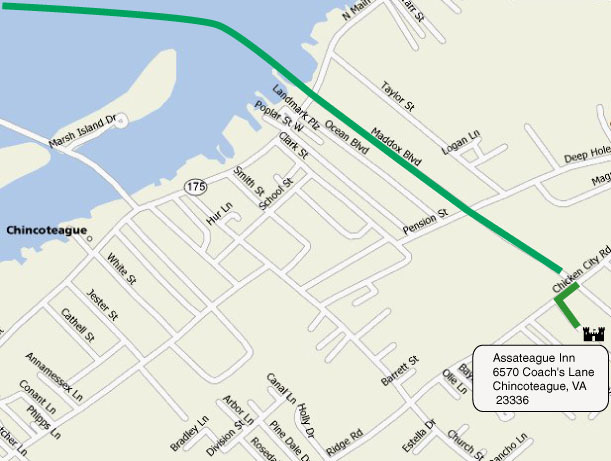 From north or south on Route 13 between mile markers 133 and 134, turn east onto Route 175 (The Chincoteague Road). Go approximately 10 miles. You will pass the NASA flight facility, and cross over a causeway. After the bridge, cross Main Street onto Maddox Boulevard. Go to the second traffic signal and turn right onto Chicken City Road and take the first left (at our sign) onto Coach's Lane. Proceed 0.4 mile to Assateague Inn at the end of the Lane on the creek.